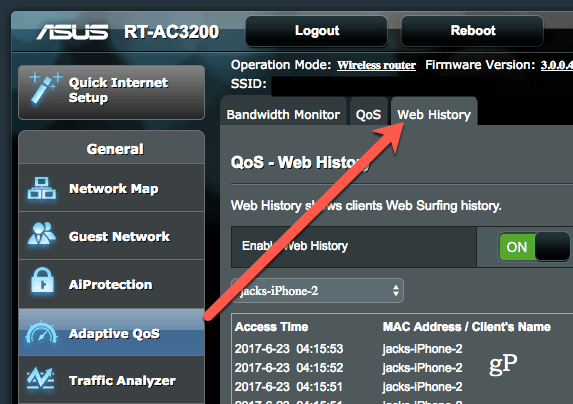 If you have an ASUS router, there’s an easy way to see the last websites any device on your network has visited. Now that every kid knows how to clear their browsing history or use incognito mode or private browsing, it’s harder to keep tabs on what possibly seedy corners of the web they visit. Short of standing over their shoulder while they are browsing, there aren’t very many free and easy ways to monitor their internet activity. But if you have a newer ASUS router, here’s a quick tip that’ll let you see what website your child is on right now. Under the General section, click Adaptive QoS. 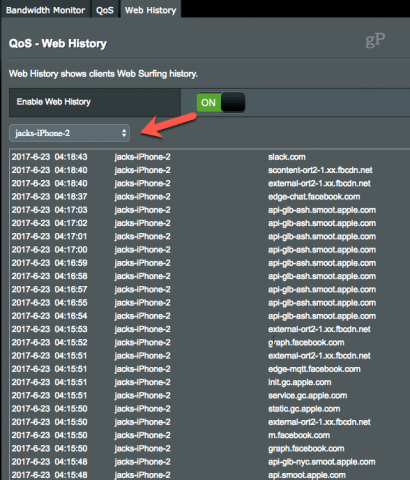 If it’s not already, toggle Enable Web History on. In the drop-down list, select the device you want to monitor. Review the list of websites to see where they’ve been. Click Refresh at the bottom to update the list. As you’ll notice, the web history log is very small. To make matters worse, it captures everything. Most of the entries will be for ads or background processes that use the internet. Because of this, you’ll really only be able to see the last one or two websites that your kid has been on. But if you know your kid is hiding out in his bedroom on his tablet and you’re curious about what he’s up to, this is a foolproof way to find out. Do you keep tabs on which websites your kids visit? Tell us why or why not in the comments.